We offer not only roofing materials, but also skylights, tools & more. Find aluminum soffit, fascia, trim, flat stock coil, down pipes, eaves, elbows & more. Ready to get started ? Get in touch with our family-owned business today. 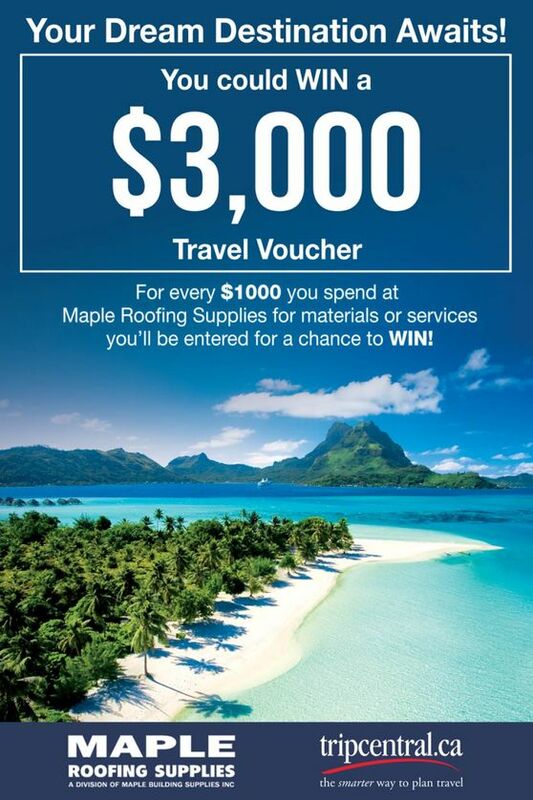 Family owned and operated since 1989, Maple Roofing Supplies is your local source for residential and commercial roofing supplies in Richmond Hill and the GTA. Whether you’re a contractor or a handyman, you’ll find all the roofing supplies you need with us, including shingles, tools and more. Our show room is open to the public and we welcome you to view our complete product line or speak to one of our experts about all of your roofing needs. We also offer the delivery of your roofing supplies right to your job site, saving you time and money with added convenience. Our Trip Giveaways Are Back! Your next dream destination awaits. Bring us your orders for your chance to win! To see our monthly winner, please visit our Facebook page.